Oh how this topic is near and dear to my heart! A few of these I've shared as standalone posts (this one, for example), but a little repetition and reminders never hurt anyone, what? I think I might start ending all of my sentences with 'what?' or 'what-ho' or 'rather', which is what they do in my current read 'Very Good Jeeves! ', which speaking of repetition, I just mentioned in this post. They say things like, "Quite the private Zoo, what?" I have no idea what that's supposed to mean, but it's funny as all heck. FOCUS MELISSA. Anyway, I love dollhouses, if you didn't know that already. I have a Pinterest board devoted to the topic. When I'm only a little bit of an older elderly old lady than I am right now, I'm going just sit around and decorate a dollhouse and play with it. That's my plan for elderly life, playing with a dollhouse. Don't you dare talk me out of my fantasy! Here are some new, and some vintage, but ALL delightful books about dollhouses that might have escaped your notice, so I hope I'm doing Something Good by shoving these in your face. 'This is My Dollhouse' by Giselle Potter looks so so so sweet. A little girl and her best friend have a bit of a tussle processing their feelings about which of their dollhouses is better - a perfect and brand new dollhouse or the deeply loved handmade dollhouse belonging to the first friend. They decide at the end that the handmade dollhouse is the most fun. Now, I'm gonna have to say - I don't agree with this moral HA HA HA. Obviously the more awesome new one would be more awesome, what-ho! I think you all can tell what kind of mood I'm in today. 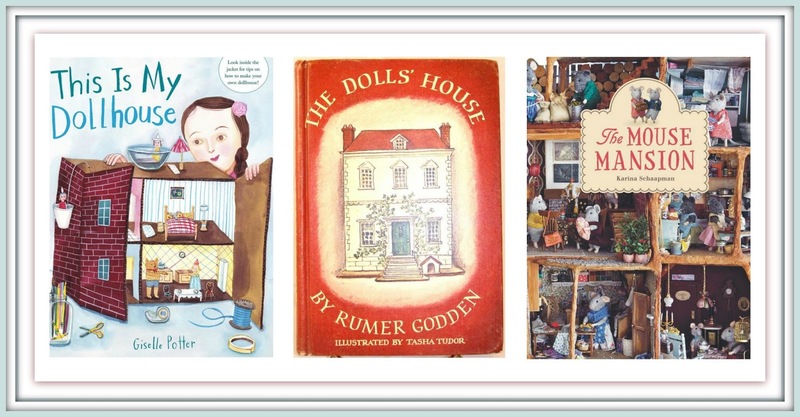 Please RUN for a copy of Rumer Godden's 'The Dolls' House'. Go. Get. It. This book is pretty intense for a dollhouse story, I'll tell you. It's wonderful! And it packs a sporting punch of a VILLAIN in the shape of a mean spirited dolly named Marchpane, who comes to live in the doll house with the other dolls, who are not mean. I LOVE THIS BOOK! You'll want to kick Marchpane. I know I did. Also, I kind of want to change my name to Marchpane. 'The Mouse Mansion' is simply incredible and you need to see it to believe it. Friends, this doll house is REAL, and when you see all the detail work that went into this REAL doll house, you will FAINT. Plus cute stories about mice best friends living their best mouse child lives in this amazing and fantastic REAL doll house. You NEED this book. I don't own 'The Dollhouse Fairy' by Jane Ray . YET. I'll be changing this state of affairs. A little fairy with an injured wing, who has to be nursed back to health within a dollhouse she's wandered into? COME ON. 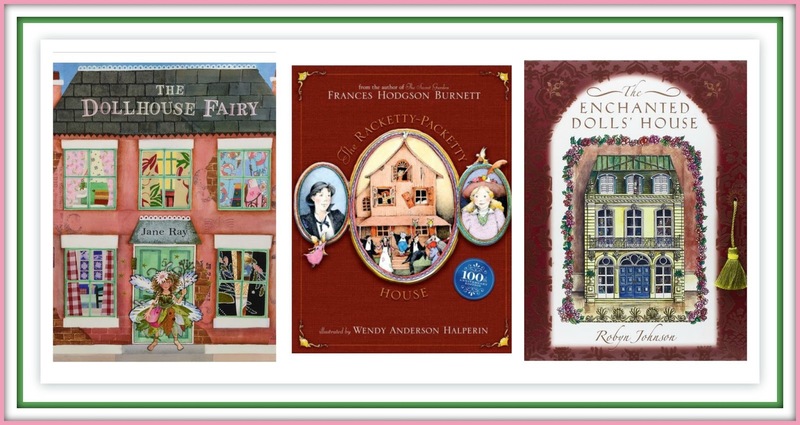 'The Racketty Packetty House' by Frances Hodgson Burnett is the gold standard by which all other dollhouse stories should be judged, and for good reason - it's the BEST, and even though I already own the same beautiful copy I've had since I was tiny, this new one with artwork by Wendy Anderson Halperin looks really charming. If you're not familiar with the story, go get it right now. A family of dolls, who used to be the grandest of the grand, have fallen into shabby disrepair, along with their dollhouse. A new dollhouse, with new dolls, comes to live in the nursery of their little girl owner, and they're a hoity-toity lot - except for the one doll who falls in love with one of the Racketty-Packetty house dolls. Many hijinks ensue. And worst of all - the old dollhouse seems bound for the incinerator. UNTIL - a royal little girl comes over to play and realizes that the dollhouse is the same type of dollhouse that her royal grandmother had and wants to restore it to its former glory. Take THAT hoity-toity dolls! YOU NEED THIS ONE. Oh, and there's also fairies in this story as well. I leave you with 'The Enchanted Doll House' by Robyn Johnson, which has always passed me by, but I really need it for my collection. I don't buy shoes, makeup, handbags, or much of anything really. I buy books. So don't judge. This is a four dimensional book with pull out dollhouses and things to open and touch. It appears to be out of print, so you have to buy it used or pay a pretty penny for a new copy copy from a 3rd party, but I think it seems worth it for the serious collector. Do you like the look of these? You might also like this dollhouse post I did awhile back. And you might also like THIS ONE. PS: I NEED this 'Anne of Green Gables' pop-up doll house. I NEED IT. Me too me too! I don't own the Rumer Godden, and yeah I've got to have the Tasha Tudor version!!!!!!!!!!!! I like doll houses!! i'm not sure if I ever read a book about doll houses to our kids. These books mentioned seems like a lot of fun. I presume you saw this one http://www.junkaholique.com/2016/11/little-interiors.html . OH MY GOODNESS, I don't think I ever saw that one, and it was the CUTEST!!!!! Thank you for sharing!!! 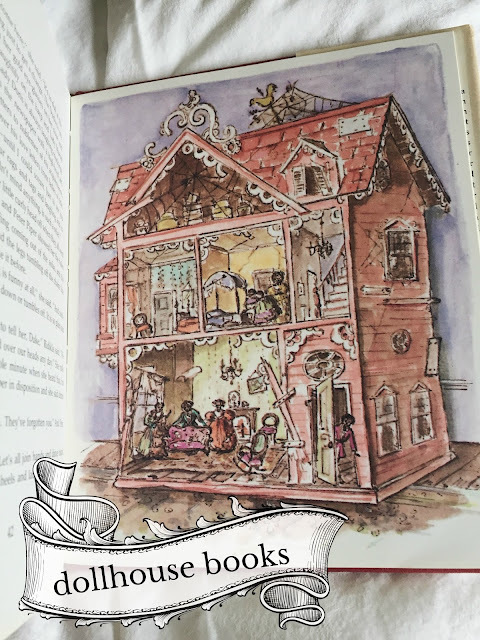 When the Dollsk Woke and Midnight in the Doll's House by Marjorie F. Stover are two of my favorites, with the former being the book that launched me into a dollhouse frenzy that's lasted 3 decades. 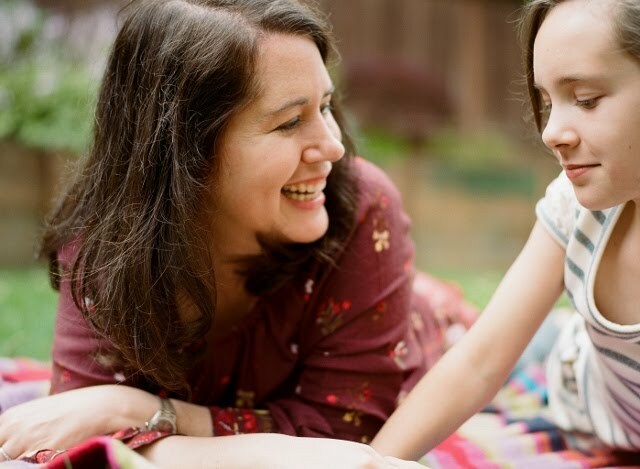 A Child of Their Own, by Justine Rendall is also pretty wonderful. Those are all out of print but can be found. And SHOULD be found. Of course there is The Doll People series by Ann M Martin and Laura Godwin. Those are fun and have amazing illustrations. And of course, after reading this post I went and found my new copy of Racketty Packetty House with the illustrations by Wendy Halpern to reread. Thanks for this post. I am constantly on the lookout for new and new to me dollhouse books.